MAJOR REVIVALS broke out in the Civil War armies. In the Union Army, between 100,000 and 200,000 soldiers were converted; among Confederate forces, approximately 150,000 troops converted to Christ. Perhaps 10 percent of all Civil War soldiers experienced conversions during the conflict. Abraham Lincoln, though he knew the Bible thoroughly and spoke often of an Almighty God, was never baptized and was the only United States president never to join a church. Before 1830, many leaders in the anti-slavery movement came from the South. Three of the nation’s leading Protestant denominations—the Presbyterians, Methodists, and Baptists—all divided over slavery or related issues. These church divisions fractured political parties, and ultimately helped to divide the nation. As early as 1818, Presbyterians unanimously declared at their General Assembly that “the voluntary enslaving of one part of the human race by another” is “utterly inconsistent with the law of God.” Ironically, however, the same assembly upheld the decision to depose a Presbyterian minister because he held anti-slavery views. And in 1845, the General Assembly agreed that slavery was a biblical institution. A “Great Revival” occurred among Robert E. Lee’s forces in the fall of 1863 and winter of 1864. Some 7,000 soldiers were converted. Revivals also swept the Union Army at that time. Sometimes preaching and praying continued 24 hours a day, and chapels couldn’t hold the soldiers who wanted to get inside. Chapels often were built in soldiers’ quarters. In 1864, the Army of Northern Virginia alone boasted 15 chapels. One chapel built by the Army of the Tennessee seated more than 1,000 people. Before the Civil War, it was rare to find chaplains in American armies. During the war, they earned a lasting place. The Constitution of the Confederate States of America specifically invoked “Almighty God”—unlike the Constitution of the Union. Further, the Confederate Constitution prohibited the foreign slave trade. Millions of tracts were distributed to soldiers during the war. (Average price: 1,500 for $1.) The U.S. Christian Commission alone distributed 30 million tracts, including many through a young agent named Dwight L. Moody. Christians who opposed the war on religious grounds were often persecuted. The Brethren eventually were allowed to be exempted from military service if they paid $500, but most suffered for their stance. For example, John Kline, moderator of the Brethren Annual Meeting, became distrusted because he provided medical aid to soldiers from both armies. Once he was jailed for two weeks, without cause, and in June 1864 he was ambushed and murdered. Abraham Lincoln was the first President to use the phrase, “This nation under God.” It inspired President Eisenhower, in 1954, to add the words “one nation under God” to the Pledge of Allegiance. Many Civil War generals stood so committed to observing the Sabbath that it influenced their military operations. Stonewall Jackson would fight only “more ordinary battles” on Sunday, and William Rosecrans refused to pursue a fleeing enemy force on a Sabbath day. Other generals attributed defeats to the fact they had violated the Sabbath by fighting on that day. E.M. Bounds, now famous for such books as Power through Prayer, served as a Confederate chaplain. He displayed great courage on the front lines, and he was captured by Union forces at the Battle of Franklin. During the war, a chaplain asked a severely wounded youth if he was a Christian. The soldier gasped, “Yes.” The chaplain said, “Then you have nothing to fear,” and left to die the future Supreme Court Justice Oliver Wendell Holmes. 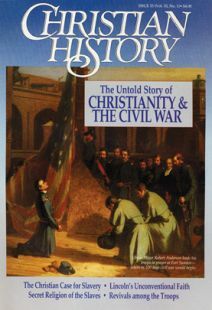 Key Civil War generals, including Braxton Bragg, Joseph E. Johnston, and John Bell Hood, were converted to Christ during the war. Many preachers, especially in the North, felt that through the war the final glorious reign of God would begin. Both sides thought the war would be over in three months. Instead, it lasted four years, until 364,511 Union and approximately 260,000 Confederate soldiers lay dead from bullets and disease. More Americans died in the Civil War than died in all other American wars combined.